Ms. Smith joins Lewis & Munday in its D.C. office after serving as Chief of Staff and Senior Policy Advisor to the U.S. Department of Agriculture’s Rural Utilities Service, and the Senior Legal and Tax Policy Advisor to the Rural Business Cooperatives Service during the Obama Administration. She has also served on detail as an Attorney Advisor to the Office of General Counsel Multi-Family Housing Division in the U.S. Department of Housing and Urban Development. Prior to her service in the public sector, Ms. Smith practiced all aspects of real estate development law to include affordable housing, commercial and corporate real estate finance for over a decade at national law firms. With more than two decades of legal experience, Ms. Smith focuses her practice on real estate finance and regulation, affordable rural and urban housing and community development, project and infrastructure financing, and mortgage lending. Ms. Smith assists for-profit and nonprofit businesses and government agencies. Her main clientele are corporate and cooperative business organizations; financial institutions; real estate development corporations; institutional investors and foundations; as well as farms and agricultural businesses. She brings an innovative, practical, and solution based approach to Lewis & Munday and is licensed to practice law in D.C, Maryland, Michigan and New Jersey. Ms. Smith earned a B.A. at Howard University, a J.D. at Rutgers Law School, and an LL.M. in Taxation, specializing in International Taxation, at Georgetown University Law Center. She has published numerous articles in peer-reviewed law journals and magazines and spoken in various venues about the role of the development attorney in the affordable housing industry impacting both rural and urban communities. 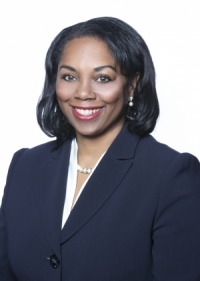 Ms. Smith is on the Governing Committee of the ABA’s Forum on Affordable Housing and Community Development Law, and has served as Chair of the Affordable Housing Committee of the ABA's Real Property Section. For more information, please visit Ms. Smith’s attorney profile page by clicking here.